It�s been a busy and productive week here, with much to reflect upon and share with you. 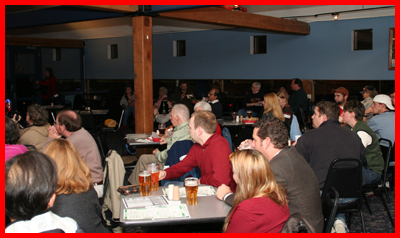 On Tuesday night, I participated in the Theology on Tap…TOT. You may have heard about this program, geared for young adults. For the last several years around the country, TOT has brought groups of young people together to meet at restaurants and taverns, where a more informal dialogue about faith can occur. It has been very successful and very well received throughout the country. 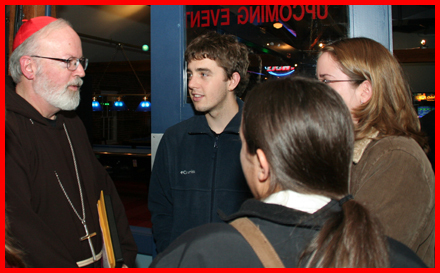 I was happy to say yes when I was invited by our Archdiocese�s Office of Family Life and Office of Young Adult Ministry to go to Lowell this past Tuesday to partake in the Theology On Tap. 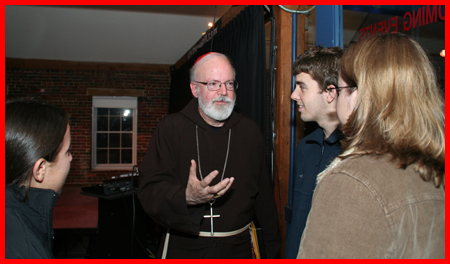 I was pleased that we were able to extend the program to the Lowell area of our Archdiocese. I was also so pleased to see so many young people avail themselves to come together on Tuesday night. It was an unusual venue, being at a restaurant-bar, but people seemed to enjoy themselves. TOT was scheduled for 7:00. That night, there was a rainstorm and the traffic was very heavy. But despite that, a good size crowd braved the weather to join us. I am grateful for their participation. There were even three students from Boston College, who traveled up to Lowell to be with us. I was so gratified that they would come from so far with most of the people participating on Tuesday being from the Lowell area. Obviously there is great interest on the part of young adults to learn more about their faith. So I was very happy to part of it. It was certainly an unusual setting for a meeting, but with TOT the restaurant/tavern setting fosters an informal discussion on faith. 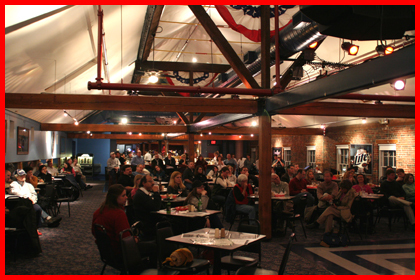 I was pleased by the turnout of young adults at the Brewery Exchange In Lowell for TOT. Crowd shot for TOT in Lowell. I was impressed that Boston College students Robert VanAlstyne, Lindsay Wilcox and Jen Kendall braved the traffic and weather to join us. I would invite and encourage our young adults to participate in the program and gather together at an upcoming Theology on Tap meeting. The next one takes place on Tuesday October 24 at 7:00 in Boston at the �Harp at the Garden.� Fr. Matt Williams will be the guest speaker. There was much to rejoice about this week in our own Allston-Brighton neighborhood, both with the good news of an agreement with the Presentation School Foundation and with a special Mass of Celebration for the St. Columbkille School coming up this Sunday. The Mass will take place at 11:15 a.m. on Sunday at St. Columbkille to celebrate the partnership between Boston College, St. Columbkille and the Archdiocese. Fr. Bill Leahy, President of Boston College, Msgr. William Fay, the Pastor of St. Columbkille and Fr. Joseph O�Keefe, Dean of the Lynch School, will concelebrate the Mass with me. We are very lucky to have a number of Catholic Colleges and University in the Archdiocese. They have all generously expressed a desire to be supportive of Catholic education. In many ways they are reaching out to our Catholic Schools and being of assistance on many different levels. The recent partnership between Boston College, St. Columbkille and the Archdiocese is just one wonderful example. This union was forged to make this school a great success, to guarantee that they have the resources they need and to make sure that Catholic education will be a very strong reality in Brighton as we go forward. Boston College has committed significant resources for St. Columbkille School. Additionally, they have made commitments for teacher development, support services and state-of-the-art approaches to teaching and learning. All of that has sparked a great deal of interest in the school. We see that the enrollment has jumped from 190 students last year to over 280 students this year, with a jump also in Kindergarten and Pre-Kindergarten. We are very grateful to Fr. Bill Leahy for his great role, efforts and generosity for the St. Columbkille School and the Archdiocese. I also wish to thank Msgr. Fay, the new Pastor of St. Columbkille, who has worked tirelessly to make this a success. We also hope that as we work on the 2010 Initiative for Catholic Schools, people of the Archdiocese will see that the Catholic Church is very serious about our educational system. We must have the highest quality education to strengthen the Catholic identity of our schools and to try to make it as available as we possibly can to as many Catholic and non-Catholic children as possible throughout the Archdiocese. Last Sunday, I had the pleasure of participating in the 125th Anniversary Celebration of St. Bridget Parish in Maynard. It was a beautiful experience. I was quite impressed by the fact that the Choir did a lot of polyphonic music, which one doesn�t hear too often. They performed many beautiful Latin Mass arrangements. I think that for a festive occasion like that one, the parish enjoyed very much hearing those special arrangements. Obviously it meant hours and hours of practice on the part of the choir prior to the Mass. It was apparently a labor of love for them. You may not be familiar with polyphonic music. It is harmonized music. The old four part Masses featured much polyphonic music and it was very prevalent in the 15th and 16th centuries. It�s quite beautiful. It�s close harmony�sort of like a barbershop quartet, but in Latin�LOL! This past week, I was so pleased to celebrate the Sacrament of Confirmation for three different groups of young Catholics, with nearly 200 teenagers receiving the Holy Spirit, at Immaculate Conception in Weymouth, Most Precious Blood in Hyde Park and at St. John The Evangelist in Chelmsford. All of the Confirmations went very well. I always enjoy doing Confirmations – an opportunity to be with young people and their families at a very important moment in their life as they receive this Sacrament and recommit themselves to a life of discipleship and the Catholic Church. I also had a Confirmation at a prison this past week. In an upcoming post, I�d like to share with you my thoughts about prison ministry and the role of clergy in prison ministry. I’d like to take an opportunity now to respond to some blog visitors� comments. Again, I am grateful for your time in visiting and returning to my blog. I am also thankful for your thoughts, questions, support and prayers that you continue to share with me through my blog. First �Jamie,� thank you for your comment and kind words. There has been much discussion recently and perhaps a degree of confusion about the Tridentine Mass and Latin Mass. Latin is still the official language of our Rite�the Latin Rite. Catholics, we, since the Second Vatican Council of 1962-1965, say the Mass in the vernacular – local language – as well. Any Catholic Priest in the Latin Rite can celebrate the Mass in Latin. The question at hand is about the �old� Rite, the Tridentine Mass. In order to celebrate the old Rite, you need permission of the Bishop. We are authorized to give that permission if�for a number of reasons�there are enough people who are requesting and there is a pastoral need and if we have assurances that those same people are not rejecting the validity of the �new� Mass, then we are allowed to grant permission. In the United States, I suspect that many Dioceses have Tridentine Masses. Most Dioceses have a Tridentine Mass somewhere in the Diocese. Usually it�s a rather small, but a very committed community that goes to that Mass. There are churches that have Latin Mass with the new Rites. The numbers of such Masses are very limited because there isn�t a great demand for them. There has been one here in the Archdiocese of Boston for many years. It will continue. That is not in question. I initiated one when I was in Fall River at the request of people who wanted to have one, and after guidelines were satisfied. The numbers in the United States have always been relatively small. In Europe by comparison, this is a much more pressing issue, where there a very large numbers of Catholics who are very attached to the Tridentine Mass. But, it�s my belief�.and I agree with the Holy Father�where there is a pastoral need, that we will allow it. As I mentioned, we already have a Tridentine Mass here in the Archdiocese and if for some reason there were many more people that wanted to have another Tridentine Mass, well, then we would add another Mass. I don�t foresee at this moment the need to add another one, but we stand ready to respond to whatever pastoral needs there are. It�s not a question of anyone being obliged to celebrate the �old� Mass. As far as the language is concerned, the �new� Mass can be celebrated in Latin without permission. As a matter of fact, when I was first ordained, if we celebrated Mass alone, we were supposed to celebrate it in Latin. I still follow that custom. The idea being that the vernacular was allowed for pastoral reasons for the people. In all of our Missals, the Sacramentary � the book priests use for Mass, in the back of the Missal, there is a section that contains all of the prayers and readings in Latin. It is there for what one may call �private� Masses, although strictly speaking, no Mass is really �private� because even when saying Mass alone, the whole Church is spiritually involved. �John,� thank you for writing. I�m very sorry to learn that your newborn son is going through a challenging time. I�m sure that this must be a tremendous stress and pain for you and your family. Through the intercession of St. Joseph, who is now your son�s heavenly patron, may this noble Saint, who cared for the child Jesus, watch over your beloved son. Please know that your entire family, as well as all who read this, will be remembered each day when I celebrate the Mass. I wish I were able to respond personally to each and every individual comment on my blog. Please know, that I appreciate all of your comments, prayers and well wishes. You are all in my prayers. 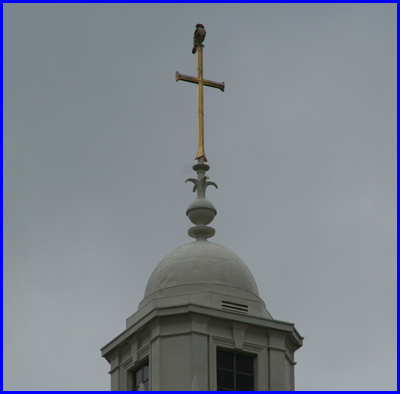 Beautiful shot of a hawk perched on a cross here on the Chancery grounds in Brighton. Well, I look forward to posting again next week �and again, thank you very much for visiting my blog.